Welcome to the Infopedia's guide to Indianapolis, affectionately known as "Circle City." Here, you'll find information about the city itself, as well as a little background info on the history of Indianapolis and a short list of things to see and do in the city. Enjoy, everyone! For those of you who will be traveling to Indianapolis in the near future (hopefully to fill up the RCA Dome at a Colts game), the first thing I would suggest is to visit the two links listed below. They're from a site called CircleCity.com, which is a sort of online guide to Indianapolis. Another great site that you might want to take a look at is 465.com, an electronic magazine run by Terry Moore. Like CircleCity.com, it contains lots of great links for things to see and do in Indianapolis, as well as local news and other important information. If you're planning on traveling to Indy anytime soon, you can't go wrong with either of these two sites. In addition, for those of you interested in getting seats to a Colts game, you can click on this link, which has a seating chart of the RCA Dome and ticket information. As always, if you have any questions, please e-mail me. The present site of Indianapolis was an area of rolling woodland when it was selected by a group of 10 commissioners as the location of the new Indiana state capital on June 7, 1820. It was chosen because it was close to the geographical center of the state. Only scattered Native American villages and two white settlers and their families were located in the region at the time. The city was laid out in the wheel pattern of Washington, DC. In January, 1825, the capital of Indiana was moved here from Corydon. In its early days, the city grew mainly because of its importance as seat of the state government. By the turn of the century, Indianapolis had emerged as an important manufacturing center in the Midwest and the commercial center of the rich agricultural region surrounding it. automobile race at the Indianapolis Motor Speedway, an outstanding race course, has brought international fame to the city. 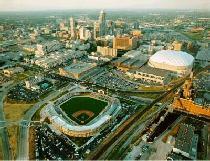 Indianapolis is also referred to as the nation's amateur sports capital. Indianapolis hosts several US Olympic trials. Among the city's industrial products are pharmaceuticals, airplane and automobile parts, television sets, electronic equipment and medical diagnostic equipment. among the notables buried here. 431 N Meridian St, bounded by New York, St Clair, Meridian & Pennsylvania Sts. (1878-88). Structure of Indiana limestone with copper dome. (Mon-Fri; closed hols) Tours by appt. Between Washington & Ohio Sts and Capitol & Senate Aves. A 250-acre historic site. Costumed interpreters depict life and times of early settlement in this 1836 village; contains 39 buildings, including Federal-style brick mansion (1823) built by fur trader William Conner (guided tours). Working blacksmith, weaving and pottery shops; woodworkers complex; self-guided tours. Visitor center with changing exhibits. Hands-on activities at Pioneer Adventure Area; games, toys. Picnic area, restaurant, gift shop. (May-Oct, daily exc Mon; Apr & Nov, Wed-Sun; closed Easter, Dec 25.) Special events throughout year. 13400 Allisonville Rd, approx 6 mi N of Expy 465, in Fishers. Indiana State Fairgrounds, 1180 E 38th St.
displays. Exhibits include the Indiana Museum of Sports, Indiana radio, forests of 200 years ago, a small-town community at the turn of the century, paintings by Indiana artists. Changing exhibits. (Daily; closed hols.) 202 N Alabama St, at Ohio St.
4790 W 16th St, 7 mi NW. Grounds are free exc during May; track tour. Collection features American, Asian and pre-Columbian art; 20th century art and textiles. Outdoor concert terrace, sculpture court. French chateau showcases two centuries of English, Continental and American furniture, silver and ceramics. Also examples of 18th-century German porcelain. Tours. Eiteljorg Gallery of African & South Pacific Art. Allen Whitehill Clowes Special Exhibition Gallery. Month-long celebration precedes the Indianapolis '500,' held Memorial Day weekend. Numerous events include the 500 Ball, Mechanic's Recognition Party, Delco Electronics 500 Festival Parade, Mini-Marathon, Memorial Service. For ticket information, contact the Indianapolis Motor Speedway. Sun before Memorial Day. Indianapolis Sports Center, 815 W New York St. 10,000-seat stadium. World-class players compete in week-long event. Phone 317/632-4100 or 800/622-LOVE. Mid-Aug.
Fairgrounds. E 38th St between College Ave & Fall Creek Pkwy. Grand circuit horse racing, livestock exhibitions, entertainment and special agricultural exhibits. Phone 317/927-7500 or 317/923-3431 (evenings). Early-mid-Aug.
135 S Elm, 13 mi NW in Zionsville. Several restored homes. Phone 317/873-3836. 1st wkend Oct.
Fairgrounds off I-74 in Shelbyville. Demonstrations, exhibits, entertainment. Circle Theatre (Indianapolis Symphony Orchestra and a variety of other shows), 45 Monument Circle, 46204, 317/639-4300. American Cabaret Theatre (all year), 401 E Michigan St., 46204, 317/631-0334. Butler University, Christian Theological Seminary and Marian College offer a variety of productions throughout the academic yr; contact the individual schools for details. North of Downtown; south of Broad Ripple Ave, west of Keystone Ave, north of Kessler Blvd and east of College Ave.
Northeast area of city south of 96th St, west of IN 37, north of 82nd St and east of Keystone Ave.
South of I-465, west of Meridian St, north of 86th St and east of Zionsville Rd. South of 11th St, west of College Ave, north of McCarty St and east of West St and Indiana Ave.